In Sea Beauty, Novomatic take you on a trip down under. No, not to Australia. Down under the waves! This slot game is located on the sea floor and the reels are hanging out amongst the coral. Sea Beauty is made by Novomatic and there’s no mistaking that. The design of this slot is so typically Novomatic that you could never mistake it for another developer’s slot. It has 10 paylines that pay from left to right across 5 reels. There are 3 rows (3 positions on each reel). The star of this slot game is a beautiful mermaid and she a real and true Sea Beauty. 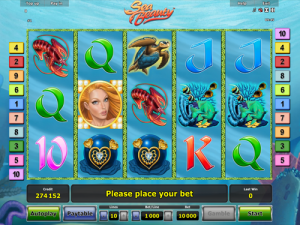 Sea Beauty is a video slot and all of the symbols are animated, including the blonde mermaid. In fact, when she lands on the reels and gives you a win, she pouts for you! When you open the paytable, you can see a beautiful view of some tropical, turquoise waters underneath a blue sky. There’s also a shipwreck there from which all the treasure has sunk! The overflowing treasure chest is another symbol on the reels, along with some other sea creatures. The RTP percentage of Sea Beauty is 95.04% and that’s very standard for Novomatic slots. Sea Beauty has Free Games which you can win, which come with the Sea Beauty feature. Other underwater-themed slot games from Novomatic include: Mermaid’s Tale, Dolphin’s Pearl Deluxe, Sea Sirens and Mermaid’s Pearl. Novomatic’s Sea Beauty has the same rules as the majority of slot games. You spin the reels and hope that the symbols land in favourable positions so that you can get paid! It all starts with paylines, which are paths drawn across the reels (from left to right). Some go horizontally across, some go diagonally across and some take unique paths! You need matching symbols to fall on these payline to give you payouts. They can’t fall anywhere on the payline though, they have to follow the payline from reel one and then on consecutive reels, without gaps! The minimum number of matching symbols you need is 3, except for the Sea Beauty (blonde mermaid) as she only needs 2. There are 10 paylines in this slot and you can choose to bet on all 10 or any other number of them. If you only want to bet on 5, that’s fine. Your bet per spin will be less but you’ll only have 5 ways to win! In classic Novomatic style, the card values (10, Jack, Queen, King and Ace) pay out the smallest wins. The sunken treasure from the shipwreck give out bigger wins! There are two symbols to represent these and they are a diamond and gold necklace and a treasure chest filled with gold and jewels. The sea creatures give out the biggest wins. These are: the lobster, the grumpy fish swimming amongst the coral, the turtle and the beautiful blonde mermaid. What’s Special About Sea Beauty? This game isn’t particularly unique or ‘out there’ in terms of Novomatic slot games. In fact, sometimes when you open up a new game from Novomatic, it can have you feeling like once you’ve played one, you’ve played them all. That’s not to say, though, that Sea Beauty doesn’t have anything special about it. The beautiful blonde Sea Beauty mermaid is the Wild symbol. As a Wild symbol, she has the normal Wild ability of substitution! If there’s a ‘gap’ in a row of matching symbols, and she falls in the gap, she can be used to substitute the missing symbol so the game will award you the win. During the Free Games, her role is even more helpful! You can get 7 Free Games by spinning three, four or five Scatter symbols. It really doesn’t matter what positions they land in, as they don’t have to follow the normal rules. They’re Scatter symbols so they can be scattered! The symbol is the slot logo in a gold frame. During the Free Games, the Wild Sea Beauty mermaid expands to cover two whole reels! You won’t just see her face anymore, you’ll see her whole body – fish tail and all. This means, wherever she lands on the reels during the Free Games, she’ll be making 6 whole positions go totally Wild!